I haven’t talked about sharks yet. I was saving up to talk about them. Maybe something about shark finning, or overfishing, just the bad reputation sharks have. But I don’t want my first post about sharks to be depressing. Instead, I’m going to make a ridiculous list. When I was little my family would have movie marathons. First we’d watch the Alien movies, then we’d watch the Jaws movies (from the very scary first one and then on to the subsequently less scary/more ridiculous sequels). Since i’m the youngest child, I think I might have been too young to be exposed to 1) aliens ripping out of people’s chest cavities 2) sharks being exploded. I remember fearing that Jaws might be in the bath tub with me, or the swimming pool, or my bed at night. Although I don’t remember having fears of aliens laying eggs in my chest, I’m going to go ahead and assume I’ve blacked out those nightmares. So this weekend my sister tells me that she has a fear of sharks. And I remember, Hey, I used to have a fear of sharks too! I mean, getting certified in California where the visibility can be pretty bad, I remember doing skills and wondering if a Great White would just come out of nowhere and I wouldn’t be able to see him until he was THISCLOSE. 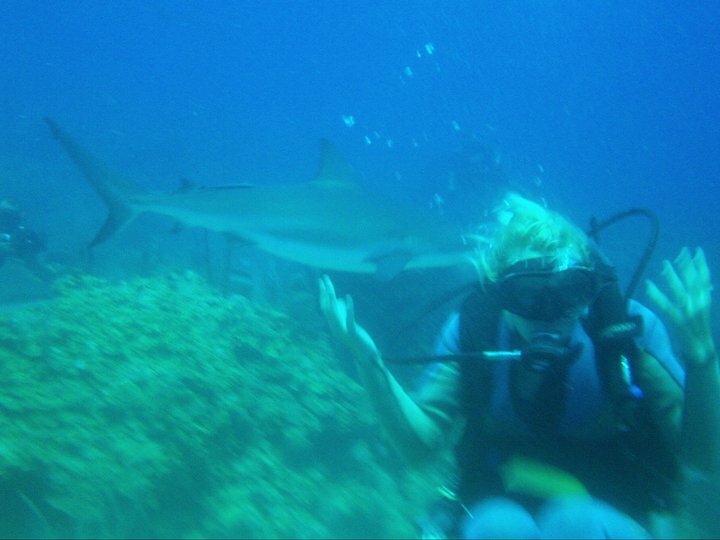 NOW look how excited I am to see a SHARK! 9) similarly, Hummers and the people who drive them. 17) Getting bit by the sheepshead at the aquarium. 18) Having a Moray Eel swim into my BCD at the aquarium. 19) Having my identity stolen. 22)Eating shrimp, or an oyster. Yuck. 23)Getting pulled into a secret room at the airport in Bangkok. 24) Coming home and finding out that someone ate my whole secret stash of candy. 28) Jon Stewart going off the air. 34) Being forced to read the poetry I wrote when I was 13…Outloud. To friends. 35) The cord on my bungee snapping. 36) My cat Tiburon getting stuck in a tree. 38) A Jaws vs. Alien type movie. 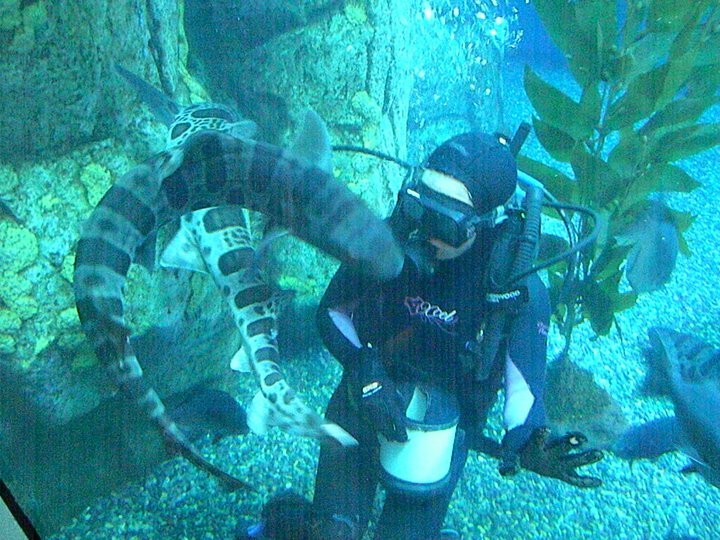 At the Aquarium, We call the Leopard Sharks "PUPPIES!" because they are soooo cute. I have a strong love for sharks. I don’t recall ever being afraid of them. I being certed in Northern California, where the vis is a lot worst (Humboldt if you can see your fins it’s a good vis day), have always longed to dive with a Great White. The closes I have come to that was one day when I was freediving and spearfishing in Trinidad Harbor. I had a friend that was fishing off his boat that day. He came over to me and insisted I got on his boat. Once I got on he explained he had a Great White surface and check him out near where I was. He said it was longer then his boat and he had a 14 foot boat. I kept an eye out for the shark on the way in but I never saw it 😦 .